If you’ve ever had the experience of reading a transcript of yourself speaking in an informal setting, you might be horrified. Few of us speak in grammatically correct sentences. We ramble and leave sentences dangling. Worse, we fill empty space with um, er, you know, and the like. Most listeners don’t notice one or two of these fillers. But use them often, and you sound uncertain. Something that doesn’t show up in the transcript is upspeak: ending your sentences upward lilt? As if they were questions? When they’re not? Women sometimes fall into this habit. It’s a problem in the work environment. If you want to be taken seriously, don’t make everything you say a question. Correcting speaking habits requires time and attention. We have to record and listen to ourselves, and then practice slowing down and catching ourselves when we try to fill empty space with empty words. But when writing, we have the chance to revise ourselves. We would never accidentally write you know or um. We don’t have to buy time when writing. We can stop and collect our thoughts. Yet, our written words may be filled with subtle habits and patterns that undermine the image we want to present to the world. If you write fluidly, as you think, then your thought patterns are reflected in the writing. If you write in a conversational tone, your speech patterns appear as well. Unfortunately, those speaking and thinking patterns can say things about us that we don’t want to broadcast. Can you spot the weasel word? Yes, it’s re-accommodate. Intentional weasel words happen all the time in business communications. But generally, you’re aware when you are using them. 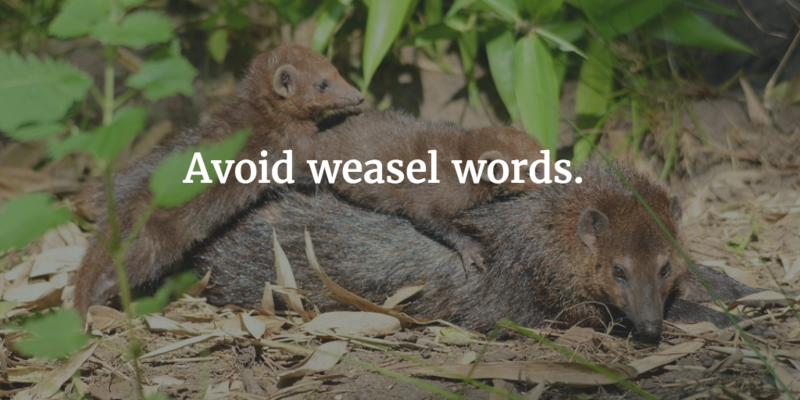 What I’m writing about here are the small, unintentional weasel words – the accidental ways that we erode meaning or diminish the strength of our writing. They appear in common words: kind of, sort of, somewhat, perhaps, some, just, simply. When writing, we have time to look through our own words and find the ones that aren’t serving us. Look through your own writing for the accidental weasel words you tend to use. Make your personal list of words and phrases to avoid. You’ll spot them because they pop up again and again. My own list changes over time. When I’m writing something important, I do a global search for those words and phrases, eliminating as many as possible. They may not all deserve to go. The word perhaps might be exactly the one you want to use. Evaluate whether you need the word: is the sentence better without it? Does removing the word strengthen the meaning or impact? Use fewer words to have a greater impact. Those words may slip in because you do not have all of the answers. That’s fine. Point out any unknowns or ambiguities. Don’t make the reader intuit your uncertainty. Instead of disguising uncertainty, you’re inviting collaboration. For more on creating your “professional” tone and style, read The Workplace Writer’s Process. As a poet, I am fully aware of crafting my meaning and message with value-packed words. There’s no time or space for extra threads. I often wish some writers would think about such word economy. There’s some really good advice here! Thank you! Thanks, Joanne. Perhaps every business writer should take a poetry class!